Along with today’s Education updates, Apple released a new version of iTunes today to allow the syncing of interactive iBooks textbooks to your iPad and to presumably add new features for the “iBooks 2.0” app and the updated iTunes U program. On my install, the 107MB download took an additional 257MB of storage space. Get downloading folks. iTunes 10.5.3 allows you to sync interactive iBooks textbooks to your iPad. These multi-touch textbooks are available for purchase from the iTunes Store on your Mac or from the iBookstore included with iBooks 2 on your iPad. • To play HD video, an iTunes LP, or iTunes Extras, a 2.0GHz Intel Core 2 Duo or faster processor and 1GB of RAM is required. • Screen resolution of 1024×768 or greater; 1280×800 or greater is required to play an iTunes LP or iTunes Extras. 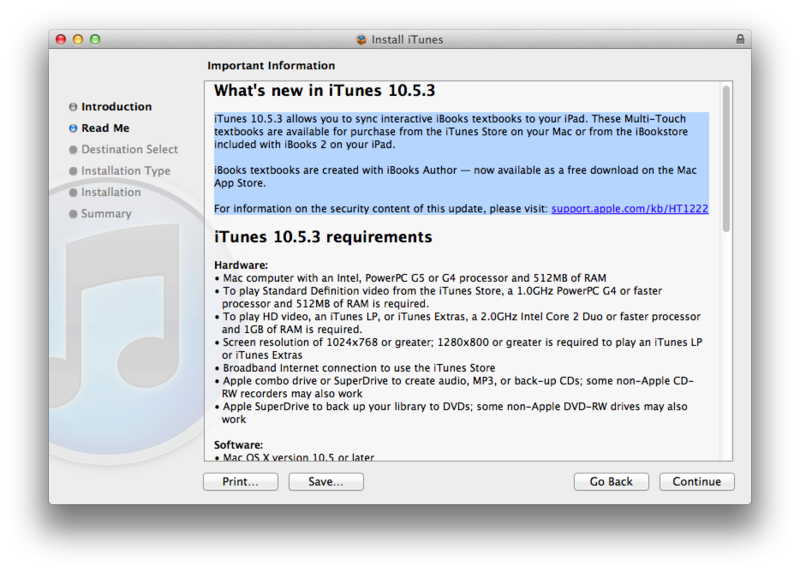 • Broadband Internet connection is needed to use the iTunes Store. • Apple combination drive or SuperDrive to create audio, MP3, or back-up CDs; some non-Apple CD-RW recorders may also work. • Apple SuperDrive to back up your library to DVDs; some non-Apple DVD-RW drives may also work. • iTunes in the Cloud and iTunes Match availability may vary by country. Using iTunes: Open iTunes and choose Help > iTunes Help. Type a question in the search field, or click What is iTunes? or a help topic. Latest product news: Visit the iTunes website at www.itunes.com. For the latest information about iPod, see www.apple.com/ipod. For the latest information about iPhone, see www.apple.com/iphone. For the latest information about iPad, see www.apple.com/ipad. For the latest information about Apple TV, see www.apple.com/appletv. iTunes Store billing questions: Visit www.apple.com/support/itunes/store. Using your iPod with iTunes: Open iTunes and choose Help > iTunes Help or iPod User Guide, or see the documentation that came with your iPod. Using your iPhone with iTunes: Open iTunes and choose Help > iTunes Help or iPhone User Guide, or see the documentation that came with your iPhone. Using your iPad with iTunes: Open iTunes and choose Help > iTunes Help or iPad User Guide, or see the documentation that came with your iPad. Using your Apple TV with iTunes: Open iTunes and choose Help > iTunes Help or Apple TV Setup Guide, see the documentation that came with your Apple TV, or see www.apple.com/support/appletv. Additional help with iTunes, iPod, iPhone, iPad, or Apple TV: Open iTunes and choose Help > iTunes Help or Apple Service and Support.